One of a marketer’s goals is to make meaningful connections with consumers. This is also one our biggest challenges. Content marketing is meant to be a strategic way to reach and attract a defined audience. Lately, it seems to have moved to a dangerous place of ROI, subject lines, and vanity metrics. We’ve lost the most important piece of the puzzle: understanding your customer. When Fitbit first launched in 2007, I was sure this was just another gadget-fad that wouldn’t last. Here we are in 2016, and I’m the proud owner of a Fitbit Charge HR and noticing more friends, family, and co-workers adding the sleek wristbands to their everyday get-up. When I fell into the trend in early November, my husband was convinced this would be something else that he found in a drawer, slowly dying after a useless life. It’s been three months, and Fitbit and I are still going strong. The other day, my co-worker Phil Renaud and I were in an animated conversation when I noticed we had matching wristbands. If you are a fellow “Fitbitter,” you’ll understand why the conversation quickly turned to “OMG, let’s compare sleep patterns.” We shared heart rates immediately (mine was slightly elevated due to the excitement). This got me thinking. I have a Fitbit, and Phil has a Fitbit. I am a 30-something female interested in marketing, sailing, and exploring the great outdoors (so Canadian). Phil is a 30-something male interested in data science who enjoys city life and travels occasionally. Our commonalities include playing instruments and obsessing over our dogs. Neither of us fall into the “Sporty/Fitness” category. If the Fitbitters that I know personally all have different use cases for owning a Fitbit, how does Fitbit connect with all of these unique personas? Are they aware of the different types of people that use their product? Do they know how these people use their product? How would they create content that resonates with all of these different types of people? Curiosity got the better of me, so I decided to run an Affinio analysis of the @FitBit Twitter following to understand who the other Fitbitters are. Briefly, Affinio is a Marketing Intelligence Platform that leverages the social graph (how people are connected) to understand the communities that exist within a defined audience through their interests, affinities, and the content they consume. 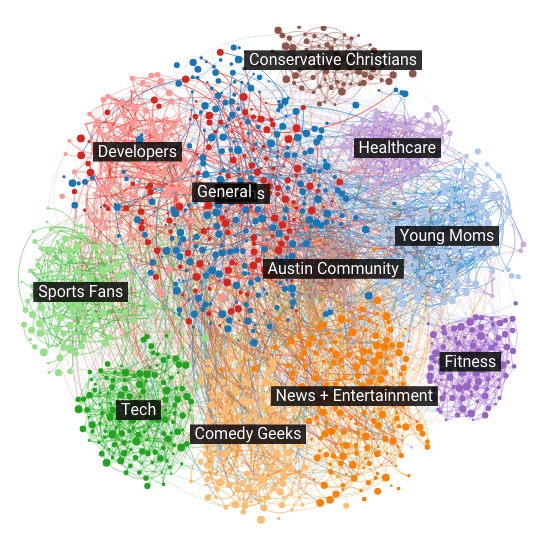 The visualization above shows the communities within the Fitbit audience. You can see the different interest-based personas that exist within their audience. It aligns with what I was initially thinking: there are some very different types of Fitbitters. With the “Consumer Attention Crisis” of today, how does Fitbit cut through the noise and make meaningful connections with all of these types of Fitbitters? We know these people have an interest in Fitbit, but what else are they interested in? With Affinio, we can see the brands, celebrities, media, and individuals that are relevant to each community, how they self-describe, the hashtags and mentions they use most, and what content they like and share. This allows us to understand each community in the context of their interests. Let’s learn more about some of the unique communities that exist within this audience. Above, we can see the highly relevant accounts for this community, giving us an inside view of what else they are interested in. 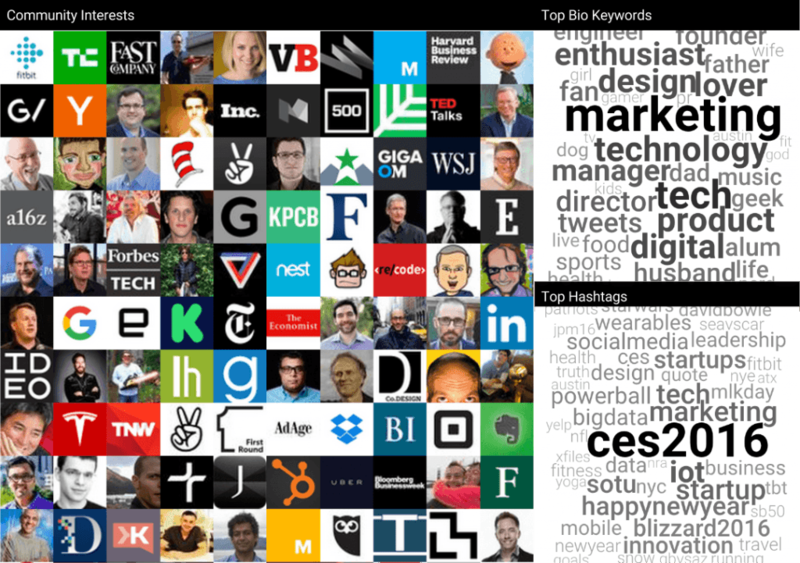 We can see the top keywords in their bios and the hashtags that they commonly use. All of this points to healthcare. It’s likely that this community are health professionals who use Fitbit to monitor and promote healthy lifestyles. Create case studies and content around how health professionals use Fitbit in their practice. Highlight the health benefits of Fitbit specific for certain medical conditions. Place content where they will find it. 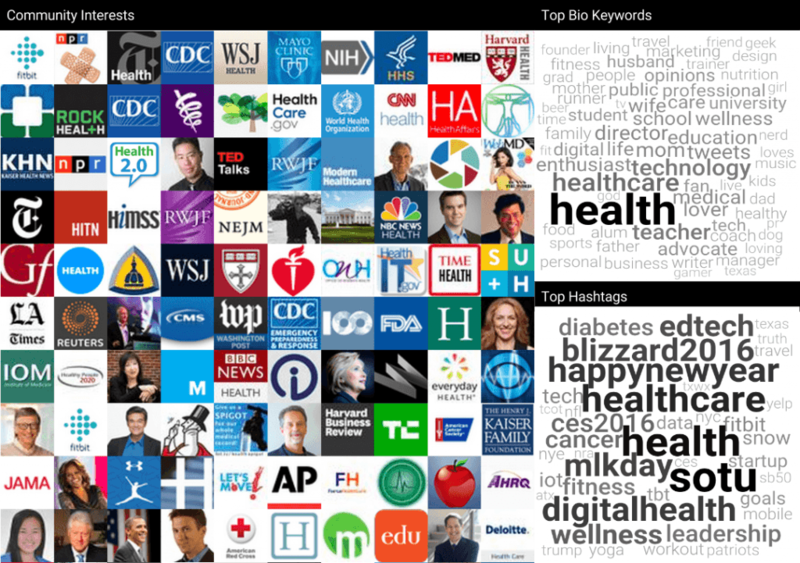 You can see in their interests that this community regularly reads NPR Health, NYT Health, WSJ Health, TED MED, etc. These interests also lead to potential strategic partners. To reach this community, Fitbit could partner with Dr. Kevin Pho, Dr. Eric Topol, or the American Heart Association. Tech people love Fitbit’s ability to track their every move and integrate that data with other apps they’re using, or perhaps even developing. In my friend Phil’s case, he plugs his Fitbit data into his Move app. Make lists of how other techies are incorporating Fitbit into their gadget library. Concentrate on innovation and the latest technology. Place content where they will find it: Tech Crunch, Fast Company, or Venture Beat. Potential Strategic partners include: Walt Mossberg, Ben Horowitz, or Nest (Control your home from your Fitbit, perhaps?). This is the community I imagined myself to be in when I bought my Fitbit, but in reality, I likely fit closer with the “Comedy Geeks” or “News and Entertainment” communities. As you can see, these people are likely using Fitbit to track progress to their next fitness goal. How to incorporate Fitbit into your fitness routine. Concentrate on how tracking your fitness will help you reach you goals. 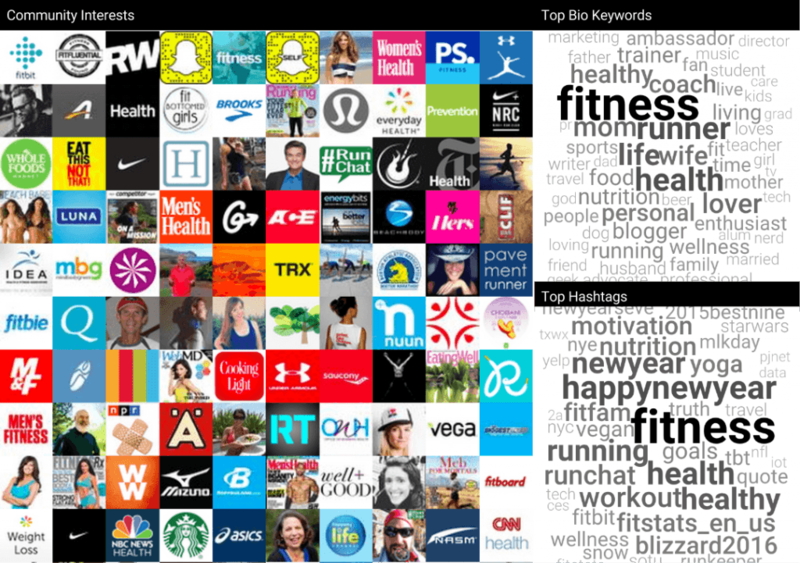 Place content where they will find it: Fitfluential, Runner World, or Shape Magazine. Potential Strategic partners include: Jillian Michaels, Dr. Oz or Karena + Katrina. From these three communities alone, you can already see a vast difference in interests and potential use cases. For too long, we’ve been pushing content first, and understanding who consumes it second. 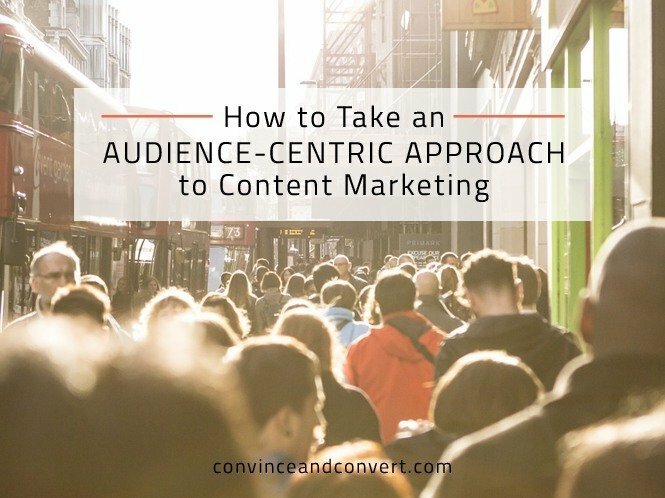 We need to flip that process and take an audience centric-approach to creating content. This understanding allows us to create content that we know will resonate with our audiences, cutting through the noise and providing consumers with helpful, timely, and relevant content.